The state of California is very much like its own country. With a diverse population of 38M (according to the mostrecent government census) and a gross state product (GSP) of almost $2 trillion (rivaling Spain and Italy), the Golden State is in many ways like a country within a country. Add to this the fact that the state has many of its own laws, regulations, and enforcements, and it is no wonder why the notion of California being its own country is such a common one. As with other pieces of legislation that support anti-discrimination claims, California is a leader in the Americans with Disabilities Act (ADA) compliance and regulation. It has a number of standards in place that go above and beyond what is required at the federal level. Did you know that braille signage and tactile signage for the state of California are different than requirements in other states? 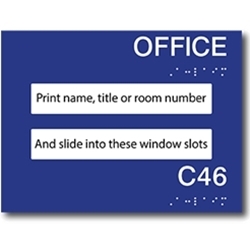 California braille signs and tactile signs have the raised surfaces more spaced apart to make it easier for the individual to read and decipher the message. California has its own braille school signs and custom braille signage using this wider spacing designation as well. If you are a business owner with locations in California and other states, it is important to note this designation or risk being fined. Because the California standard for its braille signs exceeds the standards set by other states as well as federal standards, you can use the California braille restroom signs in other states, but the reverse is not true. That is, braille exit signs that meet federal standards do NOT meet California state standards. This does mean, however, that you can order in bulk braille exit signs that meet California standards and also use them for the buildings you manage in other states. Though it cannot be said for sure, it is likely that the federal government will adopt the use of the California braille signage imposing a higher standard for all states in the nation. By ordering these new-model ADA signs, you are less likely to have to upgrade years down the road when it ends up become the federal standard for all states.